Situated in El Medano, Red Rock Surf and Kite Academy is located where all the action is, literally just in front Tenerife's hub for surfing, kite-boarding and windsurfing! Red Rock offer a variety of courses for all levels, from beginner to advanced and are multi-lingual; speaking German, English, Spanish and Italian. El Médano is the island’s ‘coolest’ resort, it is Tenerife's kite boarding and wind surfing capital, with it's laid back and friendly atmosphere you'll soon be feeling like a local. There are no cabaret tribute acts, no ‘English’ bars, no tourist shops filled with tat and, just as importantly, no designer shops with prices as inflated as their egos. The Surf Safari is purely tailored around you. The guys study the weather charts to find the best conditions for your lesson (be it beginner, intermediate or advanced), which means that if the waves are better at a different beach you'll jump in the van and have your lesson there. The classes run for 3.5 hours and are limited to small groups of 4 people to maximise your learning ability. All equipment is included (surfboard, wetsuit etc). Combined the A course and 4 hours rental ticket to receive an upgrade to 6 hours of rental free to help perfect your windsurfing ability (subject to availability). These prices have up to a 15% discount attached, book now! Are you ready for action? Take the 3 day course to propel you to pro standard! ​The wind conditions in El Medano are fantastic for kitesurfing. The possibility of wind is more than 55% throughout the entire the year. ​THE WIND - We are able to carry out our classes safely in wind ranges between 10 to 30 knots. The wind is almost always from NE but occasionally the direction is from the SW. We have a wide range of kites which enable us to teach safely across this wind range. In the bay of Medano with onshore NE winds, you will always be protected. Initially you practice on the beach with learner kites. You're taught safety rules as well as how to launch and land the kite. Once you are able to operate and control the bar,you progress with conventional kites. The equipment is always current and suitable for your individual needs. ​You are will now be ready to practice the 'body drag' in the water with your instructor. With the use of walkie talkies you will always be in contact with your instructor, for any advice and handy tip as you are taken up wind to practice. ​Today we will practice the waterstart. Our teaching method will have you up on the board safely and quickly, so you can have fun from the start. By the end of the 9 hour course, you will have sufficient knowledge and skill to kiteboard on your own and develop your skills. Paddle boarding is a great alternative to surfing/wind surfing when there is no wind or waves. There are a number of locations that are available on request. 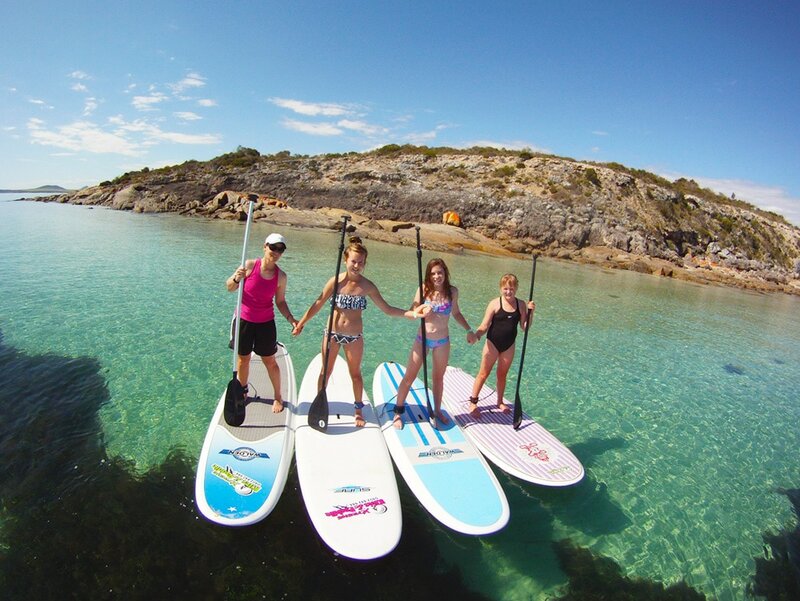 Paddle boarding is a great way to practice your balance on the board and is great for kids. The balance skills you learn here will help if you ever decide to give surfing or kite boarding a try. ​Location: El Palmar, El Poris - transport included.